SANSON, N. / MARIETTE, P. - Italia Antiqua. Italia Antiqua. - SANSON, N. / MARIETTE, P.
Size : 16.0 x 20.4 inches. / 40.7 x 51.9 cm. 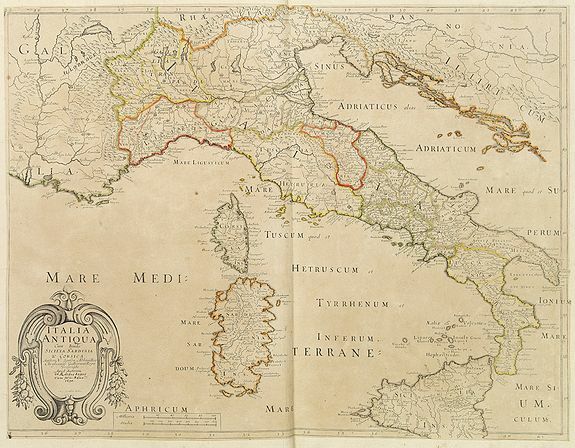 Description :A fine map of Ancient Italy. This edition carries the date 1690, in manuscript. Nicolas Sanson was to bring about the rise of French cartography, although the fierce competition of the Dutch would last until the end of the century. His success was partly owing to the partnership with the publisher Pierre Mariette. In 1644 the latter had purchased the business of Melchior Tavernier, and helped Sanson with financial support in producing the maps. In 1657 Pierre Marriette died, however his son, also named Pierre, co-published the following years. Condition : Paper contemporarily cut till plate mark and laid down on a larger sheet of paper. Good and dark impression.